Over the years, I’ve tried many different “fog free shower mirrors”, since I prefer to shave in the shower. Unfortunately, none of them stand the test of time, eventually losing their ability to remain fog free. Eventually, I just gave up..
Now, you might be asking yourself – Why is it so important to shave in the shower? Shaving in the shower is the most comfortable place for a man to shave. The moisture and steam greatly soften your beard and make it much easier to cut, resulting in a closer more comfortable shave. When you get out of the shower and towel dry, your face quickly looses the benefit of all the moisture from the hot steamy shower. Once your whiskers have started drying, you can be literally tugging on each and every hair on your face instead of neatly slicing it at the skin’s surface and moving on without irritating your skin. So when I heard about the Shave Well Fog Free Shaving Mirror, I was psyched. A quick Google search led me to Amazon.com, where the mirror received an overwhelming number of 5-star reviews! That was enough for me to give it a shot. The “trick” to this fogless mirror is simple science. Fog occurs on most so-called fogless shaving mirrors when the warmer moisture in the air condensates on the cooler surface of a wall-mounted mirror. The Shave Well fog free shower shaving mirror removes easily from the wall mounted hook – Simply hold it under the shower stream for two to three seconds. In that short two to three seconds the temperature of the moist air and the mirror surface will equalize to create a long lasting, truly fog free image for the duration of your shower. And I’m happy to report that the mirror works exactly as promised! Want one of your own? You can purchase one directly from The Shave Well Company, for just $9.99! Click here to order yours today. 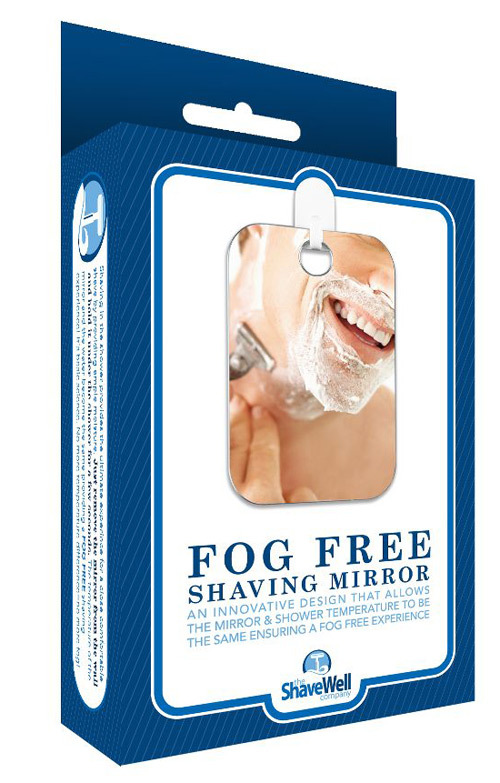 Win A Shave Well Fog Free Shaving Mirror! I shave my head in the shower every day (without a mirror) and wait until I get out of the shower to do my face, I may have to put this on my Father’s Day list! I never shave in the shower, but this is a well priced product. For $9.99 it’s probably worth a try.